The Advanced Certified Hospice and Palliative Nurse (ACHPN®) examination was designed for experienced hospice and palliative advanced practice registered nurses. To be eligible, the applicant must fulfill the following requirements by the application deadline. Hold a current, unrestricted active registered nurse license in the United States, its territories or the equivalent in Canada. Hold a master’s, postgraduate or doctoral degree from an advanced practice nursing program that includes both didactic and clinical components and accredited by the Commission on Collegiate Nursing Education (CCNE) or the Accreditation Commission for Education in Nursing (ACEN) (formerly National League for Nursing Accrediting Commission (NLNAC). Is functioning as a Clinical Nurse Specialist (CNS) or Nurse Practitioner (NP) with hospice and palliative advanced nursing practice of 500 hours in the most recent 12 months or 1,000 hours in the most recent 24 months prior to applying for the exam. An official academic record/transcript is required as part of the application process. Transcripts must demonstrate the key elements of APRN preparation which includes completion of the three core courses (advanced physical assessment, advanced pathophysiology, and advanced pharmacology) as well as a clinical practicum. Transcripts for APRN applications must be mailed to be received with the paper application by the deadline date. If applying online transcripts must be mailed to be received by the online application deadline date. Any application without transcripts will be considered incomplete and you will not be able to schedule your exam. The development of all certification examinations begin with a Role Delineation Study (RDS), where through the link you can find out more information. The Hospice and Palliative Credentialing Center has partnered with the testing service provider PSI, Inc. to offer this online exam application process listed below. Paper applications are also available and are located in each candidate handbook. Applicants MUST submit a paper application if requesting special testing accommodations (ADA related). Applicant provides personal data and choice of specialty exam on application form housed on a secure PSI website (Please provide your HOME address on your online application as ADDRESS 1) by the online application deadline date. Applicant receives notice of fee validation for selected exam which is based upon current membership status in HPNA. Applicants must have their HPNA membership number in order to receive a member discount. If an application for a new HPNA membership has been made the same day as an application for a certification exam, the non-member exam fee will display, and the applicant must agree to pay the non-member fee to complete the exam application process. Applicant reviews information and agrees. Applicant completes process of applying for the next scheduled certification exam which includes provision of credit card information for billing at time of application. The applicant will receive online verification of application receipt from the testing company, PSI. Test site locations for computer-based certification testing are determined and available through the testing vendor, PSI, Inc. These locations are subject to change. Locations are the same for all HPCC certification exams. 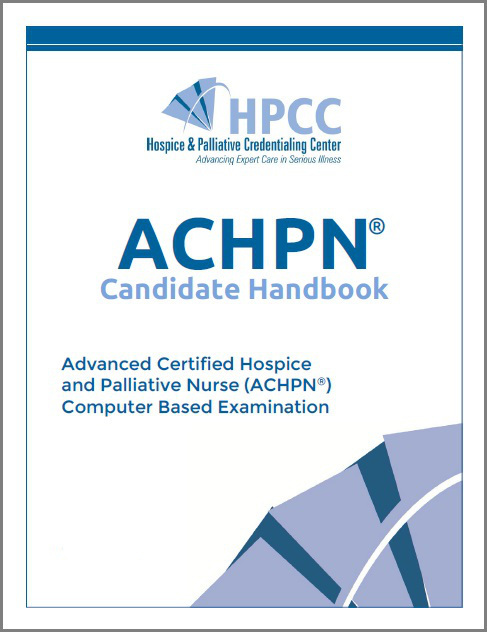 Recertification for the ACHPN® certificant is through Hospice and Palliative Accrual for Recertification (HPAR), which requires fulfilling practice hour requirements, accumulating required points through various professional development activities, and completing the Situational Judgment Exercise (SJE). Each category varies as to how the points are calculated and how many of the total points can be obtained. Each activity MUST correlate with the test content outline as published in the ACHPN® Candidate Handbook. The SJE is a required component of the ACHPN® recertification process. It uses a series of case-based scenarios to test critical reasoning and clinical application of content beyond the level of the initial certification exam. The SJE provides an in-depth assessment of the approach taken by the ACHPN® to handle the complexity of real-life clinical situations. In addition to assessment and treatment decision making, it also tests on ethical and professional topics including team building, communication, public policy and research. For more details, please download the ACHPN® SJE Guide. The SJE is available through PSI, and you may need to create a password for the site at no charge to purchase the SJE. Follow the link to Create a PSI Login and Password. After creating your account, please DO NOT follow the email links from PSI. Follow the link below, enter your HPCC certification number, and submit. Do not log in. Click “Add to Cart” first. Click here to purchase SJE. HPAR applications for ACHPN® recertification must be submitted online through LearningBuilder software. This option was developed to be user friendly and to allow candidates to submit their application in a timely fashion with ease and use of modern technology. Click here for the LearningBuilder Quick Start guide or the ACHPN® HPAR packet. The reporting period for HPAR points is also known as the ‘accrual period’. The reporting period in which you can earn points for ACHPN® renewal is your certification begin date through the time that you submit your application. The deadline for HPAR submission is 1 year to 8 weeks prior to your certification expiration date for the standard recertification fee. If you collect points and/or submit your application during the extended deadline period (during the 8 weeks prior to your certification expiration date), an additional application fee will be assessed. If you do not submit your HPAR application, your ACHPN® certification will expire on the expiration date. If your certification expires you may be eligible for reactivation of your expired credential. Refer to ACHPN® HPAR instructions or the HPAR FAQs. If you have any questions please contact the national office at 412-787-1057 or via email at hpcc@gohpcc.org. Click here to view a brief informational slideshow on HPAR.